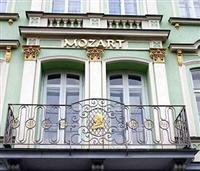 The Mozart Hotel Karlovy Vary is located near the city's central spot district. It is close to the colonnade and to the many health facilities found in the area. Karlovy Vary is also well known for its many live music performances, museums and cultural attractions which are available for touring. The largest transportation hub near the Mozart Hotel Karlovy Vary is Prague which is located approximately 2 hours away by car. The town of Karlovy Vary also has its own airport located in the southeast. The rooms at the Mozart Hotel Karlovy Vary feature comfortable furnishings and an historic feel. The Mozart Hotel Karlovy Vary is an historic building whose roots date back to the 18th century. This hotel facility does not have its own amenities onsite. Approximately 30 yards away from this facility is located another hotel, a sister establishment, which offers guests access to its facilities which include a swimming pool, a hairdresser, a massage service and many other resources. A complimentary breakfast is offered to guests of this hotel.